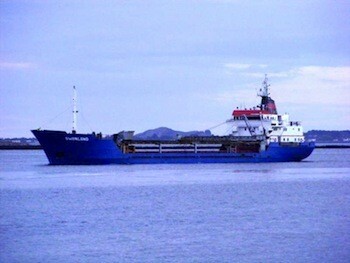 Five crewmembers from the cargo ship M/V Swanland are missing after the vessel sank in heavy seas in the Irish Sea early Sunday morning. A mayday call was received at 2am Sunday morning from the vessels captain shorlty before sinking. Two crew members were rescued from the water by an Irish Coast Guard helicopter piloted coincidentally by Prince William. So far one body has been recovered and five remain missing. Rescure efforts have been suspended overnight. The ‘Swanland’, with a crew of 8 Russians, reportedly sank very quickly after being hit by a large wave that caused catastrophic failure to the hull approximately 80kms southeast of Dublin, off Wales’ Bardsey Island. The 1,978 gross tonnes Swanland was carrying limestone from Raynes Jetty near Colwyn Bay to Cowes on the Isle of Wight when it sank. The vessel is flagged in the Cook Islands. Conditions in the area were described as extremely bad, with poor visibility and strong winds. At least five crewmembers were reported to be wearing survival when the wave hit. The video below released by the Royal Air Force shows the rescue of the two survivors who were found in a life raft.